Mordant & Kirsten open the show with tales of irascible ire and irritation. From people cutting them off in traffic to cursing them out in the parking lot, both your favorite Success Freaks have had their hands full with keeping their tempers while under duress. Did they manage to do it? Sometimes, but not always. Listen in to this episode and get an earful on how to deal with these stressful in-your-face situations. Sometimes the answer is taking a breath. Sometimes, it’s trying to see the “other guy’s” point of view. Or sometimes… you just gotta move on. 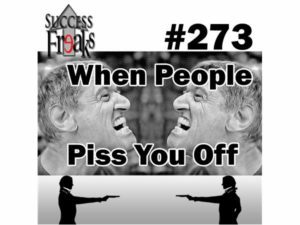 Find out for yourself what to do… When People Piss You Off.